Sapeur comes from la SAPE, short for Société des Ambianceurs et des Personnes Élégantes, or the Society of Tastemakers and Elegant People. The SAPE, like any club, has rules of conduct and of dress; it's centered around Brazzaville and Kinshasa, the adjacent capitals of the Republic of Congo and the Democratic Republic of Congo, respectively. This isn't a new subculture: the style of dress which the sapeurs imitate is that of the French and Belgian colonists who seized control over the Congo during the 1880s. The ongoing conflict in the Congo has killed, so far, 5.4 million people, and made hundreds of thousands of Brazzaville and Kinshasa residents into refugees. According to the U.N. Human Development Report for 2007, just released last month, people in the Republic of the Congo have a life expectancy of just 53 years, and a per-capita GDP of $2,030, making it the 136th least developed country on earth. The Democratic Republic of the Congo fares even worse: its life expectancy is 47, per-capita GDP is $143. It is the 176th least developed country in the world. The logistics of getting and maintaining a wardrobe of properly tailored, designer suits, plus shirts, accessories, jewelry, socks and leather dress shoes in such an environment is mind-boggling. Let alone keeping them clean. It's hard to know how to read this particular trend: is this a post-colonial pastiche of the oppressors' style of dress? Or an example of a subjugated and still impoverished people hoodwinked into spending untold sums on European labels? Perhaps unsurprisingly, these dimensions of the sapeur phenomenon have been largely ignored by the fashion press. Dolce & Gabbana's luxury magazine, Swide, wrote about Tamagni's book as a kind of curio, calling it a "fascinating" and, of course, "refreshing" "unlikely style bible." The New York Times' The Moment blog said, "what makes these images so compelling is the way they stand out among such scenes of abject poverty — they pose in their Sunday best in weed-filled lots and peacock through the streets crowded with trash and half-dressed children." Writer Maura Egan even suggested that the sapeurs' "elegance and pride brings a nice dose of optimism to the region." The book itself seems unwilling to treat the sapeurs as anything other than snazzy dressers who work really hard for their flamboyance. As designer Paul Smith writes in the introduction to Gentlemen of Bacongo, "It is incredible enough today to see men dressed so elegantly in capital cities like Paris or London, let alone in the Congo. Their attention to detail, their use of colour, all set against the environment they live in, is just fantastic." Another video examines the sapeur diaspora in Paris; the journalist estimates that around 1,500 dandy sapeurs live in the city, concentrated in the heavily African neighborhoods of the 18th arrondissement. Everyone interviewed agrees that, as one man puts it, "When we're talking about Sub-Saharan Africa and clothes, we're talking about the Congolese. The Congolese from Brazzaville. Not the Angolans, not the Cameroonians, not the Côte D'ivoirians." A documentary which screened at the New York African Film Festival earlier this year dealt with this phenomenon of Congolese coming to Europe, partly in search of jaw-droppingly expensive clothes, and the kinds of hardship they can face there. It centered around the Congolese musician Papa Wemba, a onetime collaborator of Peter Gabriel, who charges fans for "dedications" — having their names sung — and was arrested in 2003 for importing 350 illegal immigrants, posing as his band members, at a cost of some $4,000 each. [Y]oung immigrant Congolese in Paris and Brussels who embrace the sapeur lifestyle, ‘battle' each other for the title of "Parisien" — the equivalent of an exceedingly stylish man — by flashing their labels in ritual dances in night clubs and mounting challenges through preening displays of label versus label...Often without the legal documents to stay in the country, the sapeurs beg, steal, and hustle (although the specifics of these illicit activities remain ambiguous in the film) for money to be able to afford the designer clothes to keep up with Papa Wemba's fashion ideology. In the documentary, one such sapeur named the "Archbishop" attempts to establish a name for himself in the Parisian Sape scene only to later come to the realization that the extravagant and flamboyant lifestyle has been nothing more than an illusion. Chang compares the sapeurs to hip-hop stars who come out of extraordinary poverty in America craving designer labels as status markers, and indeed there is a line that can be drawn between la sape and "the glorification of material excess found in hip hop culture." 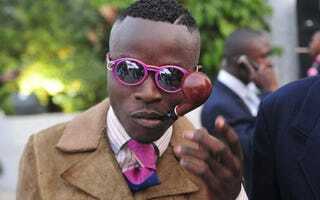 But la sape undoubtedly predates hip-hop; it owes as much to the 19th century concept of the dandy as it does to anything else. Their preference for suits, Christianity, and abstention from drugs mark the sapeurs as strangely conservative. Says Chang, "Fashion became a symbolic gesture of reclaiming power in times of economic deprivation and attempts at political dominance." And there certainly is something triumphant in a man walking through the slum he lives in, immaculately turned out. These men are presenting themselves to the world in exactly the way they want to be seen, and perhaps they are doing it because self-presentation is one of the few powers they have. But is it self-defeating to invest to such a degree in clothing? What about their families' needs? Why are there no women sapes? It seems like this book raises more questions than it really answers.